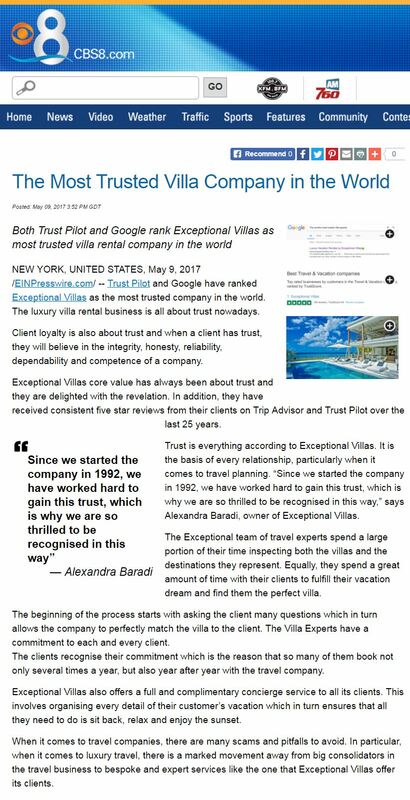 Trust Pilot and Google have ranked Exceptional Villas as the most trusted company in the world. The luxury villa rental business is all about trust nowadays. Client loyalty is also about trust and when a client has trust, they will believe in the integrity, honesty, reliability, dependability and competence of a company. Exceptional Villas core value has always been about trust and they are delighted with the revelation. In addition, they have received consistent five star reviews from their clients on Trip Advisor and Trust Pilot over the last 25 years. Trust is everything according to Exceptional Villas. It is the basis of every relationship, particularly when it comes to travel planning. "Since we started the company in 1992, we have worked hard to gain this trust, which is why we are so thrilled to be recognised in this way." says Alexandra Baradi, owner of Exceptional Villas. The Exceptional team of travel experts spend a large portion of their time inspecting both the villas and the destinations they represent. Equally, they spend a great amount of time with their clients to fulfil their vacation dream and find them the perfect villa. The beginning of the process starts with asking the client many questions which in turn allows the company to perfectly match the villa to the client. The Villa Experts have a commitment to each and every client. The clients recognise their commitment which is the reason that so many of them book not only several times a year, but also year after year with the travel company. Exceptional Villas also offers a full and complimentary concierge service to all its clients. This involves organising every detail of their customer's vacation which in turn ensures that all they need to do is sit back, relax and enjoy the sunset. When it comes to travel companies, there are many scams and pitfalls to avoid. In particular, when it comes to luxury travel, there is a marked movement away from big consolidators in the travel business to bespoke and expert services like the one that Exceptional Villas offer its clients.